Word Traveler: "Why I Go to Church"
"Transforming lives by a daily encounter with God through His Word." "Why I Go to Church"
Fellowship. What a wonderful thing it is. The magic of connection. The bonds of friendship. The comraderie. The sense of unity and single-mindedness. We are a family and the love is flowing. It’s fun. There’s joy. It’s automatic. I see a brother and I am compelled, as if by some God-empowered magnetic pull, to be near him. I have to be with my brothers and sisters to celebrate our common experience in Christ. It’s a measurable and instantaneous. I tingle all over. The original ‘God’s love at first sight.’ When my friends appear, a smile erupts. I can’t help it. Nor would I want to. I’m there. We’re there… together. It’s unexplainable and undeniable. We all sense it. Our eyes lock. Our bodies relax. We feel safe, welcomed, and loved. We’re home and we know it. Joy wells up from somewhere deep inside and an overwhelming sense of gratitude invades the space surrounding us like an invisible army of angelic warriors, silently affirming the victory that soon shall be ours as we march arm in arm toward our home in heaven. A glorious parade of saints in formation behind Jesus raising His regal scepter and inspiring a following through the generations of saints who will enjoy eternity with each other. That’s why I go to church. You are the church. At my first sighting of you, I want to celebrate. I thank God. I get encouraged. I wouldn’t miss the chance to be with you. 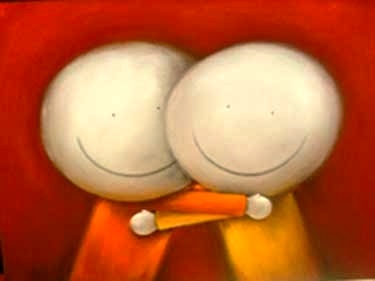 The caricature of two friends hugging is called "hug-a-friend-day" and used with the permission of photographer Mike Owens of Dallas, Texas, whose photostream is located at http://www.flickr.com/photos/dogsivu/. "At the sight of my friends in Christ, a smile erupts." Yes!! I love it when that happens! I also love it when I meet a Christ follower in a different setting and we discover we are family. Dave, you are gifted at facilitating fellowship among the family. I enjoy participating in the growing camaraderie in groups you lead. I also notice that fellowship doesn't happen automatically. I believe that we need to work intentionally at developing fellowship. I have a passion to see that fellowship grow deeper. Thanks for your comments. I really love leading small groups. Its a real blessing to see people grow in Christ in a warm, safe, and supportive group of believers. You also have a gift of leadership. I'm glad we are together in ministry. I love all this brotherly love going back and forth. Going to church has never been my strong suit in the past and I must say it didn’t hit me like lighting ether, you know to be there. But as I learn to love Christ fully and now that my life is renewed I find being at church is a gift. A gift, given to us by God and you have to remember that there have been wars over the right just to go to church. We are blessed men. Thank you for visiting my Bible web log. It is a collection of personal insights gained from my daily practice of devotional study in God's Word. The entries were inspired by a two-year Bible reading cycle beginning in May 2006. Please post your comments at the end of any article. I appreciate hearing from you. The book of 1st Samuel is the story of three men… Samuel, Saul, and David. Samuel (chapters 1-8) was a godly prophet, priest, and judge who governed Israel with integrity after the downfall of his predecessor, the mighty Sampson. God chose Saul (chapters 9-15) to be the first king of Israel. Following a run of foolish decisions, this man proved to be a weak leader who was more concerned with public opinion than pleasing the Lord. God’s ultimate favor rested on David (chapters 16-31), Israel’s next king. David was an ancestor of Jesus Christ and ‘a man after God’s own heart,’ (1st Samuel 13.14). The shortest verse in the entire Bible is in John 11: “Jesus wept” (John 11.35). These two words signify the depth of Christ’s empathy for human suffering. Jesus is the answer to everyone who longs for a God who truly cares. There are fifty-two weeks and two hundred and sixty weekdays in any given year (52 weeks X 5 weekdays = 260 days). Coincidentally, there are also two hundred and sixty chapters in the New Testament. By reading just one chapter of the New Testament every Monday through Friday, you will finish the entire New Testament in a year. If you are a little more ambitious, you may wishto read the whole Old Testament in a year on this five day a week reading plan. Avid Bible students may accomplish the entire Bible each year by simply reading both Old and New Testament columns in the reading plan provided at the links below. There is nothing magical about reading the whole Bible in a year. The study of God’s Word should not be viewed as a competition or legal requirement for believers. You don’t have to read the Bible. You get to. Enjoy your time in the Scriptures. Anticipate an encounter with Jesus. God gave me a second chance at life and demonstrated His unconditional love for me. Please feel free to read my story of personal redemption at this link: "My Story". Oregon Real Estate Broker, former Presbyterian pastor, widowed, 7 children, 2 amazing sons-in-laws, 2 fabulous daughter-in-laws, 5 cool grandkids, and 2 doodle designer mutts! My family and I attend A Jesus Church - Westside. Join us Sundays at 10500 SW Nimbus, Bldg T, Portland, Oregon 97223 or Saturday evenings downtown Portland at First Baptist. While every attempt has been made to provide reliable information, the author of this blog assumes no responsibility for absolute accuracy in all details of blog entries and comments. Information on this blog may be copied by permission from dave@davescriven.com. I have attempted to credit sources for materials used on my blog. If I have posted your quotations, photographs, art work, etc. without proper permission or inadvertently violated any copyrights, please notify me at dave@davescriven.com so I can quickly correct my mistake. Thank you for your understanding. ---with God through His Word."